I really enjoyed the job — especially after winning my first “real” trial — but after praying about things this weekend and talking things out with MDG earlier today, I realized I’d kick myself for a good long while if I graduated a hair’s breadth under a 3.0 and didn’t at least try to make it above.1 The staff was very understanding during our conversation about my decision; my hope is they’ll have me back at some point down the road if I end up heading in that direction professionally. In the meantime, I plan on using my newly-recovered free time to put some real effort into my classes and flesh out this proposal for the Small Practice Incubator & Collaboration Environment idea. I’ve been marinating on it over the past couple weeks and really think I could turn it into something awesome Fingers crossed. That’s it for now, lots going on this week then heading to New Orleans this weekend for the ABA Midyear Meeting. More soon! Most un-Christmas-y Christmas evah. Christmas is my 3rd favorite holiday of the year, following Independence Day at #1 and Thanksgiving at #2… but this year there basically was no Christmas at all With the academic stuff due I couldn’t take the time to go visit anyone (and didn’t have the money for it anyway), but then on top of it I couldn’t even put up my own tree because Samson tried eating the ornaments — the stuffed ones apparently looked like toys worth chewing apart, and the ceramic ones evidently looked like dog treats. So it was easily the most un-Christmas-y Christmas I’d ever “celebrated.” Not sure what the plan will be for next year, but I need to figure something out to stop the dog from destroying things. Finally completed NC Bar application! On January 3rd I finally got my monster-of-a-bar-app mailed off. The North Carolina Board of Law Examiners likes knowing every single thing you’ve ever done in your life since you’ve turned 18 — and, in the case of my last name changing when I was adopted at 3-years-old, the stuff before 18 — to the point where starting the app back in September wasn’t even early enough for me to get all of it done before the last possible moment. I had to request documents from the Social Security Administration to make sure I listed every single place I’ve ever worked, go rummaging through my Bucket-o’-Files to find residential records from the period right after I dropped out of college,3 go to the Clerk’s Office to find out all the cases I testified in back when I worked as the Clerk’s Office ombudsman down in Wake County, come up with 12 different character references, make three copies of everything, and on and on and on. Then include the $700.00 fee to apply, and set aside another +$125.00 to use my computer on the bar exam.4 But fortunately — it’s all done. So yay. And to anyone even older than me: START NOW or you’ll regret it! 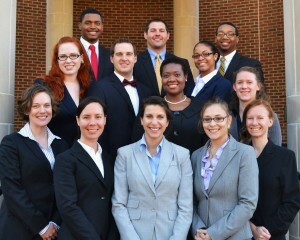 1Ls won Kilpatrick-Townsend competition. I’ve already talked about this one at length so nothing much more to say. I’m just glad it validated my philosophy that people produce a better work product when they’re forced to develop it themselves Very proud of these folks! Any guesses on which team is mine? Got a position with the Durham DA’s office… I also somehow convinced the Durham County District Attorney’s Office to bring me in as an intern First day was about 3ish weeks ago. The sheer volume of work — and the… mmm… unique folks who come through the courthouse (especially in traffic court) — have made it a pretty awesome experience so far. I could definitely see myself working there after graduation. Rewarded myself with a new laptop. In exchange for getting the DA gig, I “rewarded” myself by finally upgrading my trusty 5-year-old MacBook Pro. The Department of Education enables students to get a one-time financial aid boost once in undergrad and once in graduate/professional school for a computer purchase, and it was hitting the point where I’d need something I could use for the first couple years when I start practicing. So I’ve now gone from an original Core Duo with a self-upgraded 250GB hard drive and 2GB of RAM to a new quad-core i77 with a 750GB hard drive and 4GB of RAM Seeing how much the hardware has advanced in the past half decade is crazy. I don’t like some of the changes (e.g. there are new function keys to play/pause/rewind/fast forward, so I have to press the Function key to use Dashboard and such) but overall it’s nice being back on the leading edge of technology for another couple months. Fall grades were a disaster. While everything else was going smoothly, my grades turned out better than anticipated but worse than I wanted (if that makes sense). I’ve now fallen back below a 3.0 for the first time in a year and will have to pull off a miracle to graduate with honors. And in all likelihood I won’t be able to finish the Civil Rights & Constitutional Law concentration I’ve been working on for the past 2.5 years. We’ll see what happens. Debating giving up internship to focus on grades and SPICE. The grade situation has prompted me to reassess what I’m doing this semester, and I’m giving serious consideration to dropping the DA internship and some other activities to free up time to focus on grades and the SPICE proposal. It’s not an ideal situation, especially with the economy, but doing the jack-of-all-trades thing clearly isn’t working. I’ll keep you posted. That’s it for tonight y’all, thanks for still reading Hopefully more posts in the days ahead. Good night! NCCU Law 1Ls *sweep* Kilpatrick-Townsend competition!! I’ll try to get things caught up some time this coming weekend, but for now I wanted to mention our 1L trial teams completely dominated the annual Kilpatrick-Townsend 1L Trial Advocacy Competition this year! DURHAM, NC (01/15/12) – Defeating trial teams from Campbell, Duke, UNC-Chapel Hill, and Wake Forest, 1Ls from the North Carolina Central University School of Law (“NCCU Law”) made history this weekend when they won both 1st Place and 2nd Place in the annual Kilpatrick-Townsend 1L Trial Advocacy Competition hosted by the UNC-Chapel Hill School of Law. In just NCCU Law’s third year participating in the competition, the school’s three 1L trial teams advanced to the final round for the third straight time — a 100% record of reaching the finals. But this year’s competition featured a twist: after practicing against each other for 6+ hours a day from January 2nd-11th, Legal Eagles dominated every other school so thoroughly that both finalists were from NCCU Law, guaranteeing a 1st Place finish in the competition for the first time in school history. 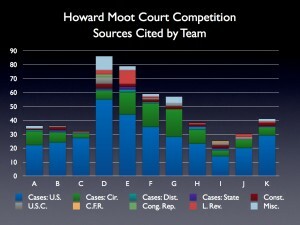 The only team to beat NCCU Law was another team from NCCU Law. Going into Saturday’s quarterfinals, all NCCU Law teams were in the Top 8: the #1-seed team of Jeannelle Alexander, Emily Custer, Amelia O’Rourke-Owens, and Ernest Roberts; the #2-seed team of Helen Baddour, Stephanie Faris, Jason Howe, and Sonyé Randolph; and the #8-seed team of Molly Brewer, Christina Carter, Jonathan Savage, and Matt Wareham. Based on bracket-style seeding NCCU was paired up against NCCU in the quarterfinal round, where Team Brewer edged past Team Alexander to advance to the semifinals, while Team Baddour knocked out a group from UNCCH Law to advance as well. Once in the semifinals, Team Baddour took down a squad from Duke Law while Team Brewer dispatched another team from UNCCH, setting up a second NCCU-vs-NCCU battle in the competition’s final round. Before a packed courtroom with nearly 70 observers, prosecution Team Brewer faced off against defense Team Baddour in a highly polished championship match. In a close finish following extensive jury deliberations, Team Brewer was declared the winner with Matt Wareham winning the award for Best Witness and Jonathan Savage taking home the title of Best Advocate Overall. With 32 teams competing, NCCU Law’s three teams made up just 9.4% of the participants — but 37.5% of the quarterfinalists, 50% of the semifinalists, and 100% of the finalists. I also had “a dog in the fight” beyond just school pride, because the results this year also validated my whole philosophy on how to approach this competition. My 1L year we were left to our own devices to develop our case, as we’re supposed to do, and miraculously ended up coming in 2nd after going 5-0 before losing in a rematch against Duke Law. Last year our 1Ls came in 2nd too (against another Duke Law team), but the 3Ls tried to micromanage the process so thoroughly — over the objections of myself and other members of that 2009-10 team — that only a few of the 2010-11 1L team members came back for TYLA/AAJ as 2Ls. Once there was new leadership on the Trial Advocacy Board, we changed things around back to how they used to be. In October all interested 1Ls had to attend a workshop on opening statements and closing arguments before trying out a couple weeks later, then once we decided who made the three teams we left them alone with one condition: they had to practice against each other from 9am-3pm from January 2nd-11th, plus extra practice as needed. During the formal practices one team would be paired against another with a third in the jury box, rotating so every team faced everyone else at least twice apiece. The variety of opposition and frequency of the practice helped ensure they were comfortable and confident when they got into Chapel Hill. I got to watch two rounds of the competition on Friday night, and then the closing arguments on Sunday. I was absolutely tickled pink at how great they did — still several pages of things done wrong,2 but a level of polish on par with some of the 2L/3L teams I’ve seen and easily better than I was as a 1L. That’s it for tonight, I’m going back to a brief. Have a great week!